The Hotel Clarks Khajuraho is the latest addition to the chain. With tastefully decorated rooms overlooking the pool or the greenery, a spacious lobby, restaurants, bar and big convention Halls, the hotel offers not only a wonderful stay but also presents itself as an ideal venue for Conferences. The temples of Khajuraho are superb examples of Indo-Aryan architecture. Situated in the heart of Central India, Khajuraho is a fascinating village with a quaint, rural ambience and a rich cultural heritage. Honoured by the worlds as a unique contribution of India to human civilisation. 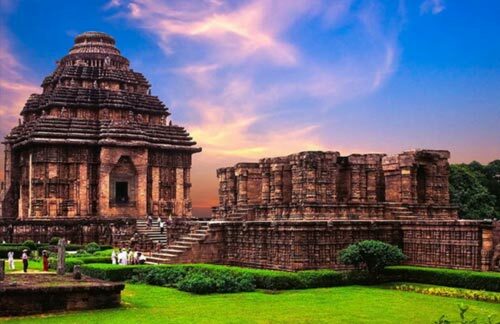 Eighty Five temples were built here by the Chandela dynasty as embodiments of indian architectural and scuptural art as its most evolved state. Ken River Lodge, popularly known as the Tree House, is a wildlifer's paradise. It is Situated on the banks of river Ken, adjoining the 542 sq km Panna Tiger Reserve. Situated 26km. from Khajuraho in Madhya Pradesh, India. It offers a unique blend of traditional royal hospitality and comfortable country living in cottages and deluxe huts. Radisson Hotel Khajuraho, the hotel is situated amidst lush gardens and is among the finest hotels in Madhya Pradesh. Hotel Khajuraho boasts 90 beautifully appointed guest rooms and provides its guests with state-of-the-art conveniences and modern amenities. Welcome to the abode of hospitality, a perfect place for all individuals, business or leisure where your expectations are always superseded. Ramada Khajuraho offers 85 elegantly furnished & ethnically designed guest rooms and bathrooms which offer too enjoying both the cubical shower & the bath tub. The Jewel of the Jungle Resort is Situated on NH76 (Khajuraho Highway at 35 kms from Khajuraho and few kms from Panna Tiger Reserve ( Madhya Pradesh , India). Resort is designed as an eco-friendly haven for nature lovers. Resort has 10 en-suite air-conditioned and 18 Air-cooled huts. The Lalit Temple View Khajuraho - just 200mts from the renowned Western group of temples (a world heritage site) - making it the closest to the temples. This superlative boutique hotel, is now a member of the exclusive Small Luxury Hotels of the World, has 48 rooms and suites offering 5 star deluxe facilities and services with a modern hi tech Spa, Swimming Pool, Conference facilities, Restaurant & Bar and Business Centre. Uma Club & Resorts is one of most experienced and renowned hotels in Satna, MP. We provide quick online hotel booking to all our guests from different parts of the India.